"We are grateful that we have been able to help our listeners and visitors to our web site with useful information provided in a format that is easy to access. I hope what I write and put on the web for free will help people make better sense out of the law and the legal system," says Stanley D. Prowse. Development of the stanprowse.com site began in 2010, with the purpose of providing a series of articles covering the major practice areas of the Law Office of Stan Prowse. Stan is a Certified Family Law Specialist. The articles cover divorce, child custody and support, family law issues in the courts, separation, senior divorce, children as witnesses, mental illness and divorce, and many more. The areas of law, Civil Litigation, Business Law, Incorporation, Real Estate Law, and Construction Law, are also included, with a wide range of articles for each area. Stan is also currently constructing a new section covering legal issues for military families. A number of articles have already been included on the web site dealing with PTSD. Since May of 2013 attorney Stan Prowse has made recorded guest appearances on the Andrea Kaye Financial News and Talk radio show. Since that time fifteen segments have been produced and aired live on AM1450 San Diego and AM1510 Las Angeles. These radio segments cover a wide range of legal topics and have also been placed on the Stan Prowse web site at http://stanprowse.com/legal-eagle-radio for easy listening at any time and on any type of device. “We are grateful that we have been able to help our listeners and visitors to our web site with useful information provided in a format that is easy to access. I hope what I write and put on the web for free will help people make better sense out of the law and the legal system,” says Prowse. The Andrea Kaye Show is a unique “variety hour show” unlike anything broadcast in San Diego and Southern California. Andrea Kaye, “Dynamite in a Dress,” is an actor, on camera spokesperson and host. The Andrea Kaye Show combines business, political science and entertainment experience into an exciting hour of hot topics, political debates, celebrity interviews, entertainment reports, topical business discussions, contest prizes and more. “Divorce is a painful subject that I had no personal experience with until recently through a close family member. Since The Andrea Kaye Show is a forum for both information and entertainment, I wanted to help others who were facing similar situations and didn’t know where to turn. I searched for months until I found the BEST family law attorney in San Diego to help my listeners with advice, tips and encouragement,” says Kaye. Stan has been practicing law for over thirty years. Stan holds a J.D. degree from Harvard Law School an M.A. from Columbia University, and a B.A. from Yale University. Stan has also served as a Mediator and Judge Pro-Tem. 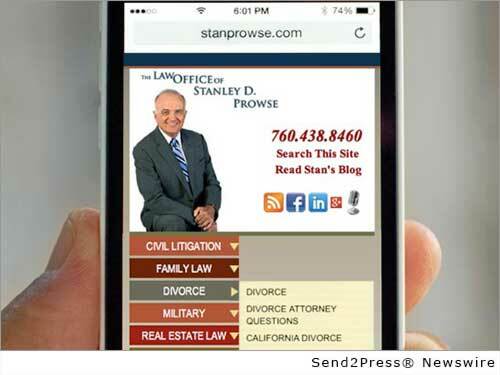 Stan is licensed to practice in California where he is a Certified Family Law Specialist (the State Bar of California Board of Legal Specialization), Maryland, Washington D.C., and Georgia. Learn more at: http://www.stanprowse.com/. Original Keywords: Certified Family Law Specialist, San Diego Attorney, Andrea Kaye Show, legal advice Stanley D. Prowse SAN DIEGO California CARLSBAD, Calif.
REFERENCES: Broadcasting News, Certified Family Law Specialist, San Diego Attorney, Andrea Kaye Show, legal advice Stanley D. Prowse SAN DIEGO California CARLSBAD, Calif.